Our beautiful and unique ballroom offers 2,000 sq ft of wide open space. 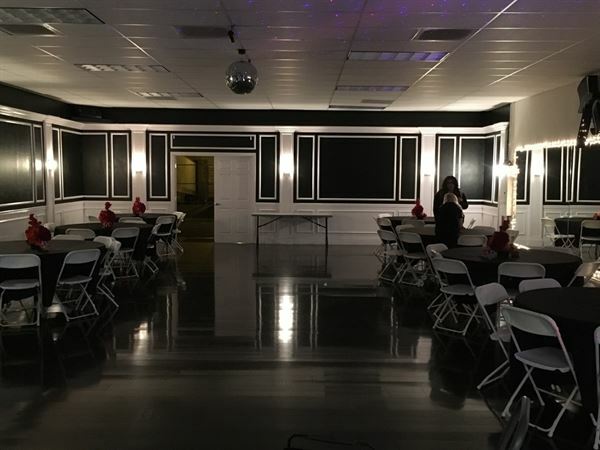 With dark wood floors, high warehouse style ceilings, and a stunning accent wall, our location can add personalization and drama to any event! We have two easily accessible bathrooms, as well as a food prep area and a unique room that can be used for dressing rooms, kids playroom and many other uses. We also offer in house table and chair rental and setups so you can avoid costly delivery and setup fees! We have an amazing sound system that can facilitate any needs, from loud party music, to microphone and computer system connectivity. In house event planner and rentals also available. Schedule your tour today!